Sandra Olsen is a full professor of Museum Studies and Senior Curator of Archaeology in the Biodiversity Institute, University of Kansas, USA. She is an Old World archaeologist who has worked in Europe and Asia for over three decades. Since 1985, her focus has been on the evolving horse-human relationship and the myriad roles it has played in ancient human history. Her research has covered European Paleolithic horse hunting, the earliest evidence for horse domestication in the Botai culture of Kazakhstan (3500 BCE), and more recently breed differentiation. In the past few years she has been studying the horse in Arabia, Egypt, and the Near East, from its first appearance until more recent historical times. 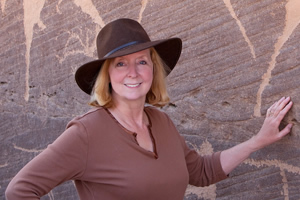 She has experience interpreting petroglyphs in the American Southwest and Kazakhstan, as well as paleolithic cave paintings in France and Spain. Dr. Majeed Khan has been associated with the Saudi Antiquities Department for over 35 years. 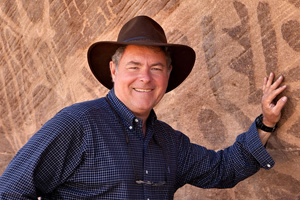 He is the world’s authority for Saudi petroglyphs and has traveled over most of the Kingdom documenting thousands of rock art and archaeological sites. He received his Ph.D in Archaeology from the University of Southampton, in the U.K, in 1989, with his thesis on Rock Art of Saudi Arabia. 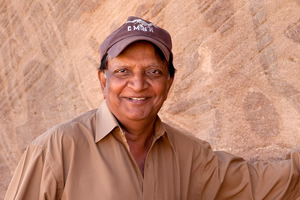 Dr. Khan is the author of several books and research papers on Saudi rock art and is currently an Archaeological Consultant in the Saudi Commission for Tourism and Antiquities. Richard T. Bryant’s background in the biological sciences has led to a particular passion for the natural world and his photography in this genre is internationally recognized. Of particular value to this project is his extensive experience photographing a wide variety of archaeological artifacts, as well as creating archival images of numerous endangered historical structures. Mr. Bryant’s range of technical expertise in a broad variety of photographic techniques ensures that the petrogylph images are captured with the highest standards. Bryant has published images in National Geographic, National Geographic Traveler, Smithsonian, Audubon, Der Stern, Fauna, Der Spiegel, National Wildlife, Globo, Natures Best Photography, Southern Wildlife, Desert Heritage and other journals. Chris Beard is a Foundation Distinguished Professor in the Ecology and Evolutionary Biology Department and Senior Curator of Vertebrate Paleontology in the Biodiversity Institute, University of Kansas, Lawrence, Kansas, USA. Two of his primary research focuses are paleoclimatic change and biogeography, the movement of species from one continent to another through time. One of the key factors in shifts in the biodiversity and the technical production of Arabian petroglyphs is the climate change from the Holocene Wet Phase to the current arid conditions. Because the origins of many of the species depicted in the rock art are not found on the Arabian Peninsula, Beard’s understanding of animal migration in both Africa and Asia is extremely valuable to this project. His knowledge of geological formation processes also contributes in identifying the nature of the conditions that produced the rock outcrops and their surface patina. • We especially would like to thank Dan Hinder, the genius behind our Web site, who, when asked to do the impossible, simply went away for a few days and made it happen! The list would be too long if we tried to describe all that he has accomplished, but the Web site is itself the proof of his achievements. His colleague Chris Smith is responsible for the layout design of our Web pages. Our editor, Matt Phillips, has worked extensively with Dan and Chris and is responsible for ensuring that our text is correct and as succinct and understandable as possible. • Randall Sargent and Chris Bartley, computer scientists at the Carnegie Mellon University CREATE Lab, were instrumental in developing GigaPan technology. They have been our primary contacts at the CREATE Lab and have helped us set up our GigaPan presentations on our Web site. We want to acknowledge all of their technical assistance and the fact that the CREATE Lab hosts our GigaPans. Without their continued support, it would be impossible for us to show such large interactive images on our Web site. Randy, Chris and the CREATE Lab continue to expand the horizons for GigaPan capabilities and adaptations to a wide array of scientific endeavors. We are extremely grateful for their talent and their help. • Our artist, Amanda Zimmerman, is a gifted scientific illustrator who specializes in natural history subjects. She has rendered very accurate and easily interpreted illustrations of the petroglyphs directly from Richard T. Bryant’s and, occasionally, Sandra Olsen’s photographs. Based in Pittsburgh, PA, Amanda has frequently produced artistic works for scientific projects at the Carnegie Museum Natural History, ranging from pen and ink illustrations to charts, graphs and maps. Examples can be seen in The Mollusks: A Guide to Their Study, Collection, and Preservation. She is a member of Guild of Natural Science Illustrators, American Society of Botanical Artists and Pittsburgh Society of Illustrators. Her body of work can be seen at seadragonrealmcom.businesscatalyst.com. • Our interpreter, Rami Salem, has thoughtfully provided accurate translations of our videos from English to Arabic and from Arabic to English. • Our volunteer, Stephen Conroy, has generously devoted an enormous amount of time locating references and researching content for the Web site. 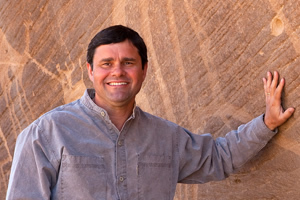 • Michael Formica and his company Three Rivers 3D, Inc., have made it possible for us to apply 3D laser imaging to the petroglyphs in this study. Three Rivers 3D, Inc. manufactures standard and custom 3D imaging products and systems used to create digital models from real-world objects. Thanks to a Keystone Innovations Zone Kick Start grant in Pittsburgh, PA, Three Rivers 3D, Inc. was able to donate a scanner and accompanying software to Carnegie Museum of Natural History. Michael trained Sandra Olsen in the operation of the scanner and the processing of the images before our team entered the field. He also produced the 3D videos of our images for this Web site. The Research Team wishes to express its gratitude to the Web Site Creative Team for all of its fine efforts in the production of the Arabian Rock Art Heritage Web site. Any inaccuracies of content are the responsibility of the Research Team.